Talk about gameplay, army lists, formations, units and single models in your favorite games. That's a total of 997 points, 58 power, with 44 models, and 104 wounds in total. This is what I'll be fielding on 22 Sep 2018, for my "40kth birthday". It's still annoying that there's no incentive to take units in multiples of seven models, so apologies for the lack of fluffiness in the numbers. Chaos Daemons armies have lots of overlapping aura abilities. By taking a mix of predominantly HQ and Troops, that means I'll have a lot of aura abilities, and a lot of units that can take advantage of them. The core of the army are the Plaguebearers, and lots of them. Last game, the other players were somewhat shocked by how many models I was fielding, and I aim to get the same reaction again. When supported by the Poxbringer and Spoilpox Scrivener, they're on +2" Move, +1 to hit (and on a 7+ get an extra attack), +1 Strength, re-roll failed wound rolls, and get +1 Damage on wound rolls of 6+. If the Poxbringer also manifests Virulent Blessing, then one unit will also get +1 to wound and wound rolls of 7+ do double damage. The Nurglings will be deployed as far forward as possible, and the Plague Drones will zip into the enemy, to tie up ranged weapons where possible. The Great Unclean One will be able to keep up with the Plaguebearer mob as well, and provide intimidatingly heavy-hitting support, likely leading the front lines of a wave of filth. Epidemius can stay at the back with his slow 5" move, and boost everyone with his Tally of Pestilence. With 8CP, particularly useful stratagems are: (2CP) regain D3 lost wounds, (1CP) double damage to enemy Psyker on Perils of the Warp, (2CP) 6" aura to re-roll 1s on Disgustingly Resilient, and of course (1CP) re-roll. I am deliberately not using summoning, as it's risky (both in terms of possibly incurring wounds, and not getting the units out in time or at all). 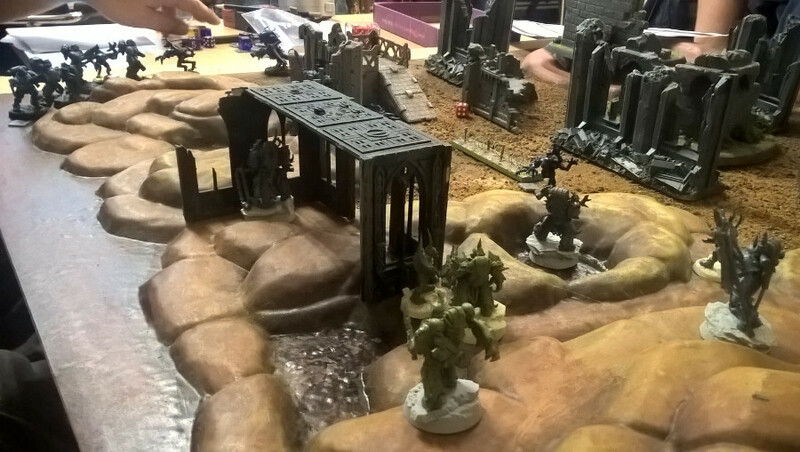 There were seven of us playing, so we randomly split into two games of Warhammer 40,000 and a three-way game of Kill Team. I was in the latter, facing Tyranids and Space Wolves, and we used the "Sweep and Clear" mission. Tyranids deployed first and Death Guard second, so of course I placed myself at the furthest corner from the close combat monsters. In retrospect it was this deployment that lost me first place, as I overestimated the lethality of the aliens. In practice, it turned out that the Tyranid Warriors with deathspitters and Genestealers lacked good enough AP to consistently damage Marines. This meant that the loyalist Space Marines were able to take down most of them, with the Death Guard clearing the rest, before we lay into each other. Ultimately the loyalists won on victory points having taken down more bugs than me, before we ran out of game rounds. 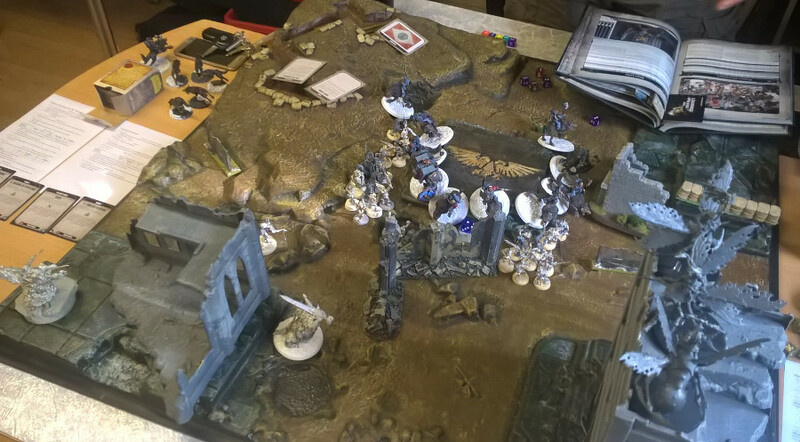 Then it was Warhammer 40,000 for me in the afternoon, paired against Space Wolves. We used the Open War cards and got a "kill the courier" mission (where one designated non-warlord model on each side is a courier, and you win by killing the opposing courier), a deployment of one team in a central circle and the other coming in from all corners (we assigned positions randomly), and a random twist that adds to psychic powers but makes perils of the warp worse. I was using the army list as posted above. The Space Wolf army was interesting in that it consisted of: a mounted Wolf Lord, a three packs of three Thunderwolf Cavalry, five Fenrisian Wolves, and a Venerable Dreadnought (disappointingly not riding a wolf). So a very fast, manoeuvrable force, and totally close combat focussed (the Wolf Lord had the only ranged weapon: a pistol). The Space Wolves formed up in the middle, with a protective ring around their obvious courier: the Dreadnought. I chose Epidemius to be my courier because he's survivable, but also because his role (for me) is always to sit at the back of the army and buff everyone by counting unit kills. 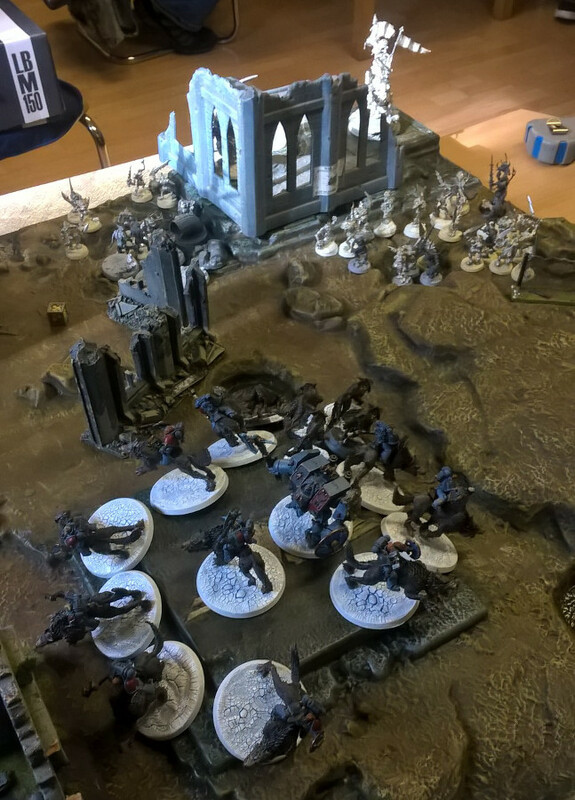 I was worried that the fast Space Wolves would outmanoeuvre me, so I pushed everything on in the same corner so that there was no way of the marines skirting my troops to get to their prize. As I moved forward to join close combat, I held back the Plague Drones in reserve on a building top, ready to engage anyone that might slip past, and held the Great Unclean One back on one side and the Spoilpox Scrivener on the other to do the same. Meanwhile the Plaguebearers and Nurglings stopped the Space Wolves from moving, with the Poxbringer joining in and buffing. I took heavy casualties obviously, but I was also wearing down the Space Wolves, and ultimately brought the remainder of my units (except Epidemius) in for the kill as the Dreadnought got exposed. Once the Greater Daemon got stuck in and it was clear that he was going to pummel anything he got close to, some of the Space Wolves made a mad dash for Epidemius at the end in a desperate bid to take him down first. But I killed the Dreadnought before they could reach the Tallyman. Victory for Grandfather Nurgle! Overall a good list. Keeping the characters close to the troops worked well for buffing them, and as they got worn down and started losing those buffs then the buffs from Epidemius stepped up the fill the gap. This game was more confirmation for me that the key to victory on the day is placement and movement. I am pleased with how it went. Wow, this was a fun read and great to get some ideas on tactics for when me and a mate get to play some in the future, though he plays Imperial Fist Primaris, so not quite as maneuverable, but I think the general premise will apply. Thanks for sharing! So what kind of speed would a wolf riding dreadnought be capable of? It looks like you had a good time both games. How do you think a Plaguebearer kill team handled the first game? Squishy enough the ‘nids would have killled them?